The City Rail Link (CRL) is being designed and constructed to the highest sustainability standards. It will set the benchmark for delivering sustainable infrastructure in New Zealand. Sustainability is a cornerstone of thinking in the CRL team where we aim to build New Zealand’s largest transport infrastructure project without using unnecessary resources or creating unnecessary waste. Once built, the CRL will give people more sustainable transport choices and we want to make sure we are sustainable in the process of delivering it. With an estimated 1,600 jobs on offer in the project at peak construction, we also want to contribute to social sustainability across Auckland, targeting employment for Māori, Pasifika and youth along with others marginalised in the workforce. To be successful, companies wanting to win contracts for construction will need to demonstrate how they are going to help us achieve our social outcomes strategy. There is no New Zealand sustainability standard for infrastructure, so we have embraced and enhanced the ISCA framework, working with Mana Whenua to make it more appropriate for the New Zealand context. In November 2018, CRL won the Sustainable Business Network’s Supreme Award - the NZI Transforming New Zealand Award. Well done team and thanks for making a difference to our environment. “The City Rail Link (CRL) has busted through construction and infrastructure industry norms to win New Zealand’s highest sustainability accolade. The City Rail Link (CRL) project has proven the infrastructure industry can reduce greenhouse gas emissions and its environmental impact while developing Auckland’s much-needed public transport infrastructure. This will result in ongoing reduction in both congestion and carbon. Taking a long-term view and calculating a whole-of-life footprint of 100 years for the project, the CRL put sustainability at the core of every decision from the outset. 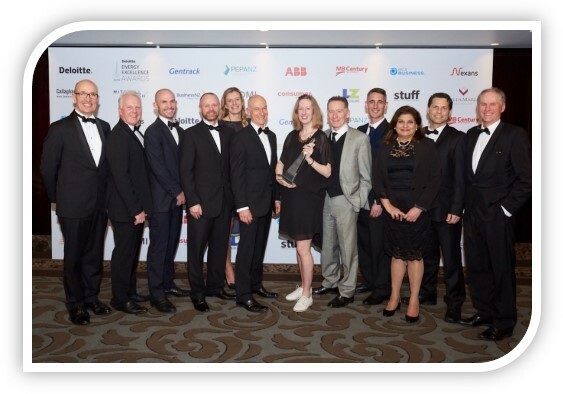 CRL won the Large Energy User Initiative of the Year category of the Deloitte Energy Excellence Awards 2018, providing recognition for exciting energy-saving projects and the work being undertaken to reduce greenhouse gas emissions for New Zealand. The award was sponsored by EECA Business.